MANILA, Philippines - The official results and list of passers of the University of the Philippines College Admission Test or UPCAT 2019 conducted on October 26-27, 2018 are released by UP College of Admissions on April 1, 2019. Below is the list of passers for UPCAT A.Y 2019-2020 with surnames starting with letters R to Z. The list is courtesy of the UP College of Admissions. UPCAT is an annual entrance exam conducted by UP Office of Admissions for aspiring UP students. For 2019, the exams are held October 2018 while the schedule of UPCAT for the year 2020 is yet to be announced by the university. To qualify for a campus, all UPCAT applicants are ranked based on their UP admission grades, then screened based on their choice of campuses. The top-ranking applicants per campus will qualify based on the campus quota and cut-off grade. UP said that the list of UP Qualifiers from schools will be sent to their principal. Individual notices will also be sent to all examinees. PRCboard.com is one of the trusted websites that provides timely and reliable information in any board, eligibility examinations, college admission tests conducted by CSC, PRC, UP and other related government agencies. For verification, we recommend to refer to UP official website. Meanwhile, to keep updated on the official result of October 2018 or 2019 UPCAT results, you may also follow us at our social media accounts via Facebook and Twitter. may result na po ba sa upcat for 2019? 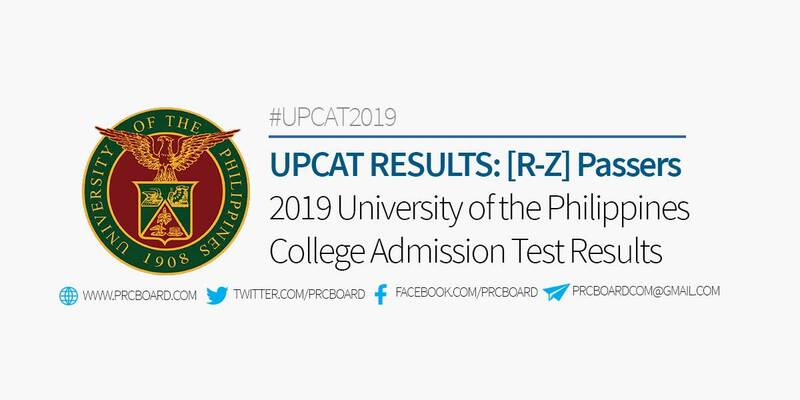 May result na ba ang UPCAT FOR 2019?